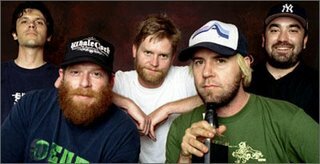 With the release of their album ‘The Sophtware Slump’ in 2000, Grandaddy were hailed as part of a group of bands (along with Mercury Rev, Sparklehorse and the Flaming Lips) rewriting the American songbook for the 21st Century. The band’s preoccupation with human/machine relationships and societal decay even drew comparisons with the likes of Radiohead. But the follow up, 2003’s ‘Sumday’, disappointed many, with its repetitive song structures and limited sonic palette. Given the promise suggested by ‘The Sophtware Slump’ the album seemed a sideways, if not backward step. Three years on, and we have the latest, and last, Grandaddy album. The forthcoming release of ‘Just like the Fambly Cat’ was announced at the same time as the band’s dissolution. After 14 years of recording and touring it was felt that the band had simply run its course. Unfortunately, there is some evidence of that here. It is not surprising, given the circumstances, that the album has a fragmented, incomplete feel, but there is also an unhealthy serving of filler. Now it’s clear that no one is showing up here. But now they’re blown away. Given the band’s decision to call it a day, the lyrics are especially poignant. Elsewhere, Grandaddy demonstrate their more playful side while still addressing issues such as alienation and loneliness. The narrator of ‘Where I’m Anymore’ is lost in suburbia amid garage sales, ice cream trucks and exercise equipment. While low-fi rocker ‘Jeez Louise’ details a failed teenage romance where ‘your mom always hated me’. It’s a rejection of modern pop culture that cleverly employs a host of modern pop sounds. Other tracks are not so successful. The largely instrumental ‘Rear View Mirror’ and ‘Skateboarding Saves Me Twice’ sound like sketches rather than fully developed songs, while ‘The Animal World’ is a repetitive drone. ‘Guide Down Denied’ is also dreary and repetitious, outstaying its welcome well before the track’s six-minute running time. And it’s not just this song that is guilty of running over time. The album as a whole drags on beyond the one-hour mark. The shedding of some of these lesser songs would have only been an improvement.